Home Grooming & Care Baby Shampoo For Dogs: Is It Okay? Baby Shampoo For Dogs: Is It Okay? Time for a bath for Bosco, right? Regardless of why your dog needs a bath, you're likely wondering what kind of shampoo to use, especially if you've only recently brought your new animal friend home from the shelter and this is your first time bathing him. You're likely also asking this because you have run out of dog shampoo, and have heard that baby shampoo works just as well. This article will help you answer if baby shampoo for dogs is OK to use, plus more. It's still relatively unclear why dogs seem to not mind being smelly. After all, they are the ones with the sense of smell that is many times sharper than a human. We have a tendency, therefore, to think that if something smells bad to us (including the dog's own natural odor), surely it would smell even worse to a dog. Wrong. Dogs gather information about their environment through their noses, and if something smells wonderful to them (like garbage tends to do), they will find a way to cover themselves in that smell. Apparently, that habit doesn't mesh with our concepts of clean-scented living—and bathing--regardless of how much we might understand our dog's habits and how much we might honor Cesar Millan as the “alpha” of dog knowledge. Besides, our friends also have to deal with our dog just as much as we do. 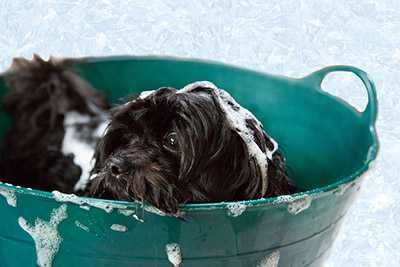 So, as soon as Fido gets friendly with the freshly bagged trash and rips it open, it's time for a soak in the tub. But so far, the question of baby shampoo for dogs has yet to be answered. This is a truly legit question, especially if you love having a dog as a pet, but you're a bit strapped for cash now and again. The answer to this question is YES, baby shampoo for dogs is OK to use if you don't constantly bathe your dog. Baby shampoo is formulated for babies' sensitive skin, so if you're out of normal dog shampoo, and need to use a baby shampoo in an absolute pinch, go ahead and grab a bottle of unscented (lightly scented is OK too), clear baby shampoo like Johnson's Natural Baby Shampoo or Aveeno Baby Wash and Shampoo. How About Regular Human Shampoo On My Dog? This is a definite no-no, because shampoos for human adults are pH-balanced much differently than dog shampoos are. Human skin pH Levels are around 5.2 to 6.2 which is mildly acidic, while dog's skin pH Levels ranges from 5.5 to 7.5 which is close to neutral pH to being more alkaline. It's also said that the sulfates in most human shampoos dry out human hair and scalps, so if your regular shampoo does that to your hair, you can imagine what such formulations would do to your best four-legged buddy! So it's better off if you stick with the baby shampoo for dogs, as long as it's clear and unscented or mildly scented. Optimally, once a month is just about right﻿﻿, though if you end up bathing your dog more (some dogs just end up being smellier than others by nature, other than the times they tip the garbage over), that's a good reason to stick with dog shampoos. Also, if you wash a dog too much, you end up stripping away the oils that give your dog's coat that glossy sheen we all love to give “wolf whistles” to, especially on the long-haired dogs. That said, if you choose to bathe your dog more than once a month (apart from flea problems), go for a soap-free or perhaps a shampoo with a moisturizer in it, just to keep the dog's skin from drying out. And a dog whose skin is dry and itchy from too much bathing is not going to like bath time overall. So, again, once a month is optimal for a doggy cleanup time. While regular human shampoo on dogs is a major no-no, baby shampoo is a good substitute because it's less harsh. 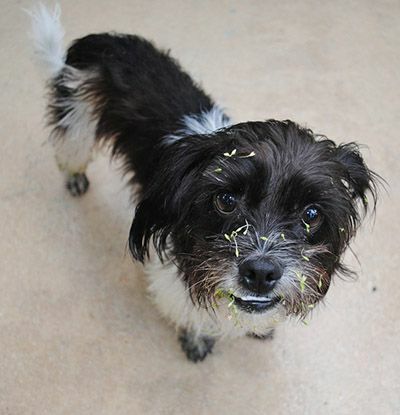 But if you need to, or prefer to wash a dog more than once a month (no more than once a week, tops! 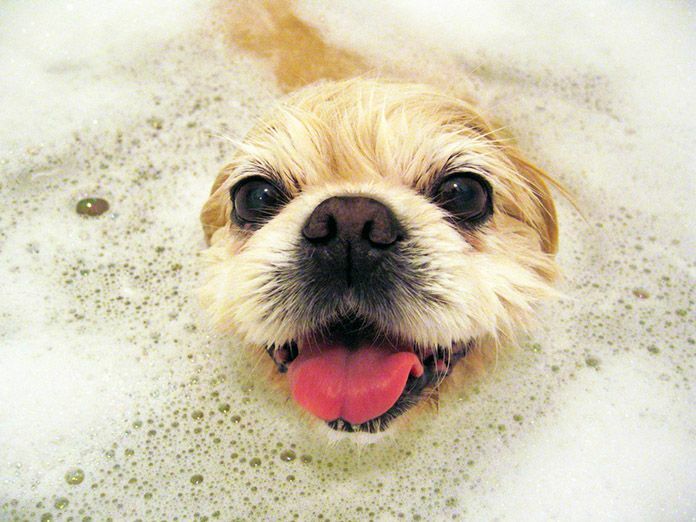 ), it's wise to stick with a dog shampoo that is suitable for your dog's skin. It's pH-balanced for a dog's naturally neutral to alkaline skin, and therefore isn't as harsh as the shampoo that's made for humans. I use a baby shampoo once for my dog and he smells great after, so if I’ve run out of dog shampoo, a baby shampoo is I think OK.